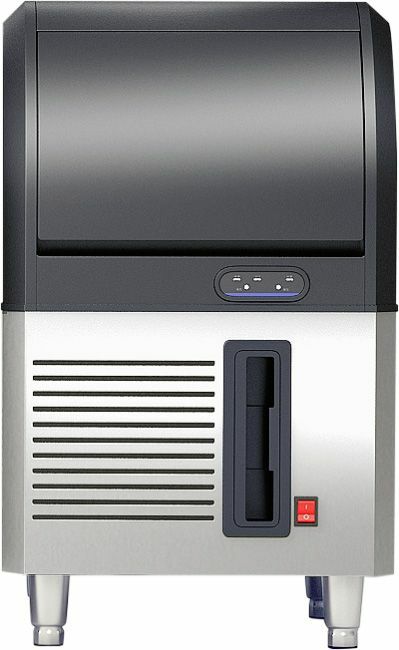 The Graupel ZBY range of ice machines (commonly referred to as commercial ice makers) is available in a range of production and storage capacity models to suit all requirements. Tried and tested throughout the European market and widely recognised for durability, each machine is backed by a 2-year warranty. The ZBY-40D model boasts an impressive 45Kg of ice generation every 24 hours. Combined with a large 13Kg capacity storage bin, it is well equipped to produce ice for the busy bar, club and restaurant environments where a constant supply of ice is required. Finished with a stainless-steel body and re-enforced industrial grade plastic, these machines are both durable and aesthetically pleasing. making them ideal for front of house use. Access to ice is ergonomic thanks to the disappearing door design. Inside the machine, intelligent technology helps to ensure superior energy efficiency, low water consumption and maximum cooling performance. Operators will find the machine easy to use thanks to simple electromechanical controls. A choice between automatic and manual water cleaning functions are available. Removable and washable front access panel with a routine servicing reminder alarm light help to ensure quick and easy cleaning and maintenance. Supplied complete with water and drain hoses for standard UK fitting. Installation and levelling are easy thanks to adjustable and removable legs. The machine should be used with a water filter to help ensure clear ice production and machine longevity. Ice scoop also included as standard. Production may fluctuate based on ambient/water temperature. Graupel are a market leading commercial refrigeration brand with a wide range of commercial fridges, freezers and ice machines, designed for the catering and hospitality industry. Highly committed to the development of modern technology, all Graupel products utilise environmentally safe CFC-free gasses and the Graupel brand is committed to offering catering businesses a new standard of ‘Green’ refrigeration that can deliver significant energy savings and reduce operational costs. By sourcing products and components from a range of manufacturers across the globe, including Italy, Japan, China and Germany, the Graupel brand offers a competitive choice for all refrigeration requirements and budgets. Each machine is warranted for true commercial use and tested for a minimum runtime of 24 hours prior to dispatch, including undergoing computer refrigerant charging, vacuum leak decay, helium leak detection, vibration noise level, visual examination and temperature analysis.